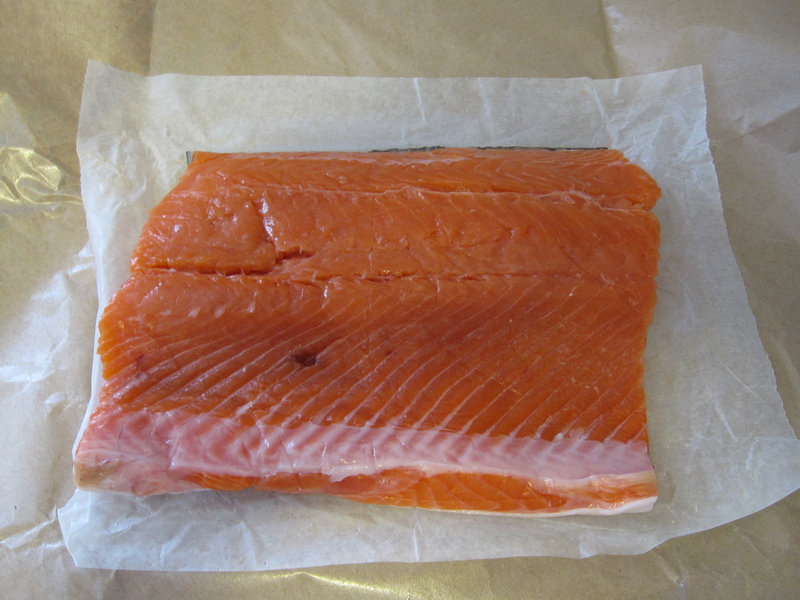 Yesterday I saw some really nice coho salmon on sale that just came in that morning. Since I haven’t cooked salmon in a while I took that as a sign that it’s time to do it up again. I decided to keep it very simple and use some Japanese flavors to appease my wife. After lunch I got the rice ready. 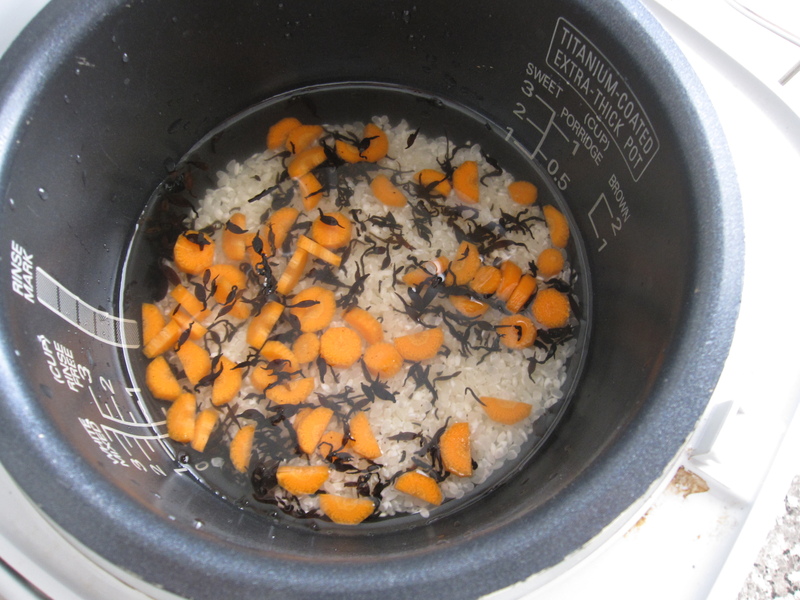 I rinsed 1 cup of rice and threw it in the rice cooker like normal, then added a couple of large pinches of dried hijiki seaweed and a diced carrot. I let it sit for about a half hour to let the hijiki re-hydrate and flavor some of the water. Then I turned on the machine and let the rice cook. When it was finished I turned it off, mixed everything together, and let it cool to room temperature. Closer to dinner time I made my teriyaki sauce. 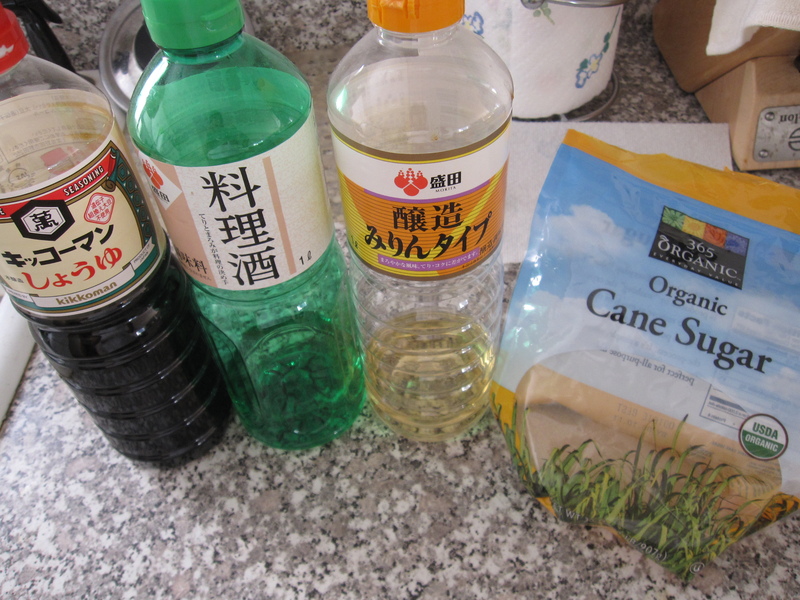 In a small saucepan I gently heated 3 tablespoons each of soy sauce, sake, and mirin along with 1 tablespoon of sugar. I let it heat just until the sugar was completely dissolved and turned off the heat before it came to a boil. I let that cool to room temperature. Here’s my 20 ounce filet of coho salmon. I cut it into 4 equal portions and marinated it in the teriyaki sauce for about 45 minutes at room temperature. While the salmon was marinating I got the abura-age ready. I had a pack of three here. I cut them in half and rinsed them off with some boiling water. They very oily and the boiling water rinsed a majority of that oil off. Then the packages open up nicely for easy stuffing. 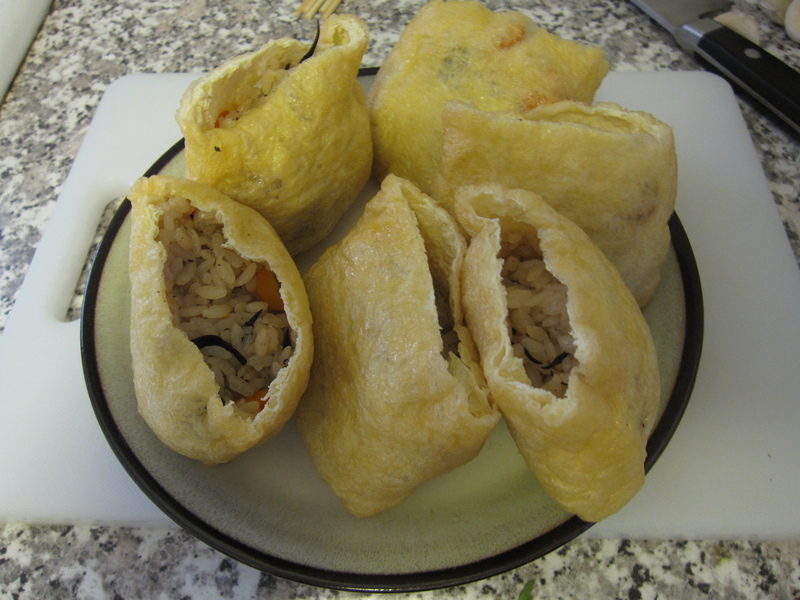 I stuffed them equally with the rice mixture and then sealed them. I didn’t have any toothpicks, so I cut down some bamboo skewers to do the job. In a saute pan I brought 1/4 cup of water to boil with 1/4 cup of seasoned soy. 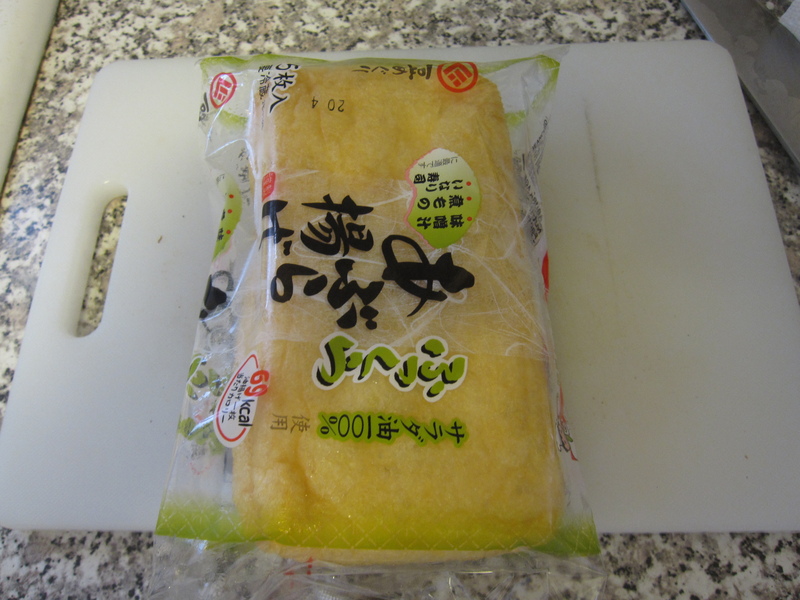 The soy is seasoned with a little dashi and mirin. Once lightly boiling I put the packets in, covered it, and turned the heat to low. This lets the broth flavor penetrate while heating up the rice. I let it go for about 10 minutes then turned off the heat and let it sit until everything was ready. I also placed the salmon under the broiler, starting with the skin-side up. About 5 minutes later I turned it over, basted the top with the marinade left in the dish, and let it broil for another 5 minutes. 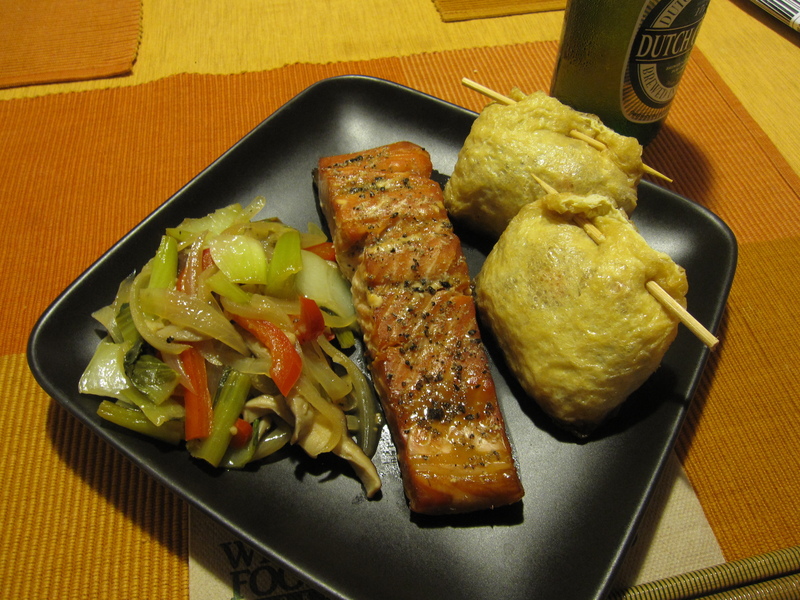 Before cooking the salmon and abura-age I got my vegetables ready. 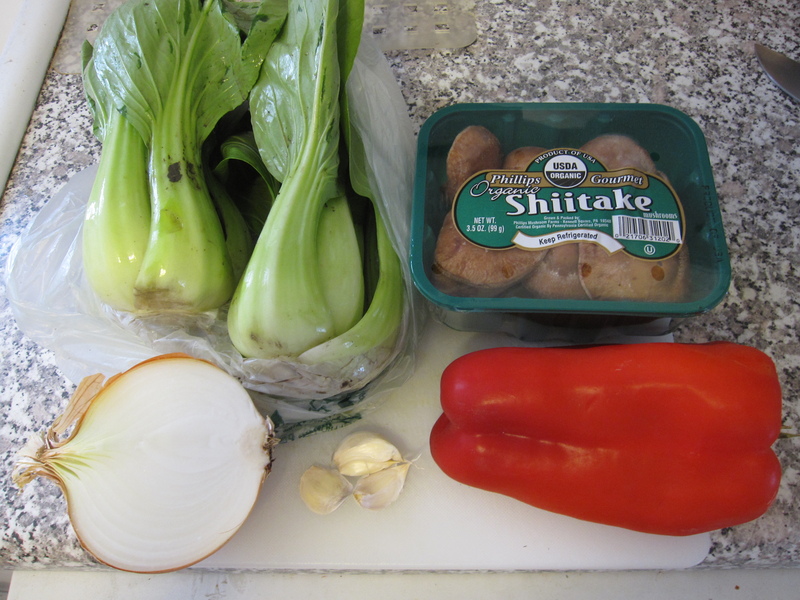 I had two large heads of baby bok choy that I separated the leaves from the stems and chopped them all down, 1/2 onion sliced, 3 garlic cloves minced, 1 package of shiitake sliced, and 1/2 a large red bell pepper sliced. While the salmon was broiling and the abura-age packets absorbing tasty fluids I heated up a pan and poured in 2 tablespoons of sesame oil and tossed in the onions to let them saute for about 4 minutes. Then I added the peppers and garlic. After another few minutes I added the shiitake and bok choy stems for about 4 more minutes. I seasoned with pepper and poured in about 3 tablespoons of soy sauce. 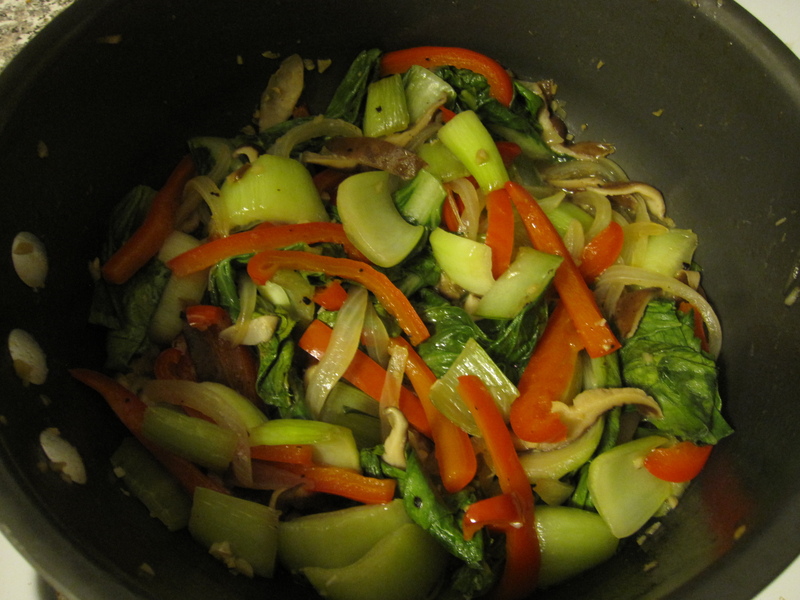 Once the soy boiled off I added the bok choy leaves, stirred them in, covered the pan, and turned off the heat. I just wanted the leaves to wilt a little. I timed it all so everything would be finished at the same time. I plated it up and scarfed it down.